24 months, 24,000 miles - parts & labor nationwide. 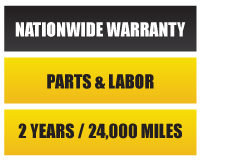 Limited lifetime warranty on many parts. *See store for details. *We offer lifetime battery warranties on Interstate batteries. Eligible passenger tires which become unserviceable due to non-repairable road hazard damage (e.g. punctures, snags, cuts, carcass breaks and impact breaks) will be replaced with a new comparable tire based on the percentage of original, useable tread that has been worn. These services are provided throughout the usable tread-life of the tire for the original purchaser only.